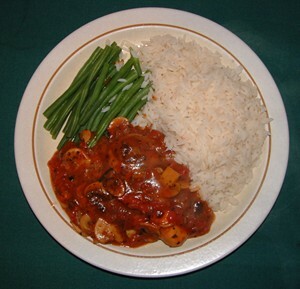 Chicken Chasseur is a classic 70s dinner party treat. Best served with a bottle of Liebfraumilch for that authentic 70s' touch. Pre-heat the oven to gas mark 4, 180C, 350F. Toss the chicken breasts in the seasoned flour. Heat the oil and fry the onion and garlic until soft and golden, then add the chicken breasts and fry gently, turning the chicken occasionally, until the chicken breasts turn golden brown in colour. Add the white wine and bring the mixture gently to the boil. Add the tomato puree (or ketchup), chicken stock, sliced mushrooms, dried herbs to taste and tinned tomatoes. Simmer gently for 10 minutes. Transfer the chicken mixture to a casserole dish and place in the pre-heated oven and cook for 40-50 minutes or until the chicken breasts are tender and thoroughly cooked. Remove from oven and stir in brandy if using. Serve with rice or potatoes and vegetables (as above - serving suggestion).